Menon, Nidhiya/Maitra, Pushkar, Dang, Archana. "Labor Market Engagement and the Health of Working Adults: Evidence from India." March 2018. Pitt, Mark/Menon, Nidhiya. "Spatial Decentralization and Program Evaluation: Theory and an Example." February 2018. Menon, Nidhiya. Health Policy and Economic Growth in India: Lessons from International Growth Center Projects. London London School of Economics: International Growth Center: 2017. Menon, Nidhiya/ Rodgers, Yana. "The Impact of the Minimum Wage on Male and Female Employment and Earnings in India." Asian Development Review 34. 1 (2017): 28-64. Menon, Nidhiya/McQueeney, Kathleen. "Christianity and Infant Health in India." April 2017. Menon, Nidhiya/Rodgers, Yana/ Alexis Kennedy. "Land Reform and Welfare in Vietnam: Why Gender of the Land Rights Holder Matters." Journal of International Development 29. 4 (2017): 454-472. Menon, Nidhiya. "Gender and Technology Use in Developing Countries: Evidence from Firms in Kenya." Journal of Economic Development 40. 3 (2015): 105-140. Menon, Nidhiya/ Rodgers, Yana. "The Impact of the Minimum Wage on Male and Female Employment and Earnings in India." January 2015. Menon, Nidhiya/ Rodgers, Yana/Zveglich, Joseph/Marife Lou Bacate. Gender Earnings Gaps in Asia: Recent Trends and Explanations. Manila, Philippines Asian Development Bank: 2015. Menon, Nidhiya/Brainerd, Elizabeth. "Religion and Health in Early Childhood: Evidence from the Indian Subcontinent." January 2015. Menon, Nidhiya/Elizabeth Brainerd. "Religion and Health in Early Childhood: Evidence from South Asia." Population and Development Review 41. 3 (2015): 439-463. Menon, Nidhiya/Kathleen McQueeney. "Christianity and Infant Health in India." December 2015. Menon, Nidhiya/Yana Rodgers. "War and Women's Work: Evidence from the Conflict in Nepal." Journal of Conflict Resolution 59. 1 (2015): 51-73. Menon, Nidhiya. "Gender and Technology Use in Developing Countries: Evidence from Firms in Kenya." February 2014. Menon, Nidhiya. "The "State" of Persons with Disabilities in India." Journal of Human Development and Capabilities 15. 4 (2014): 391-412. Menon, Nidhiya/Elizabeth Brainerd. "Seasonal Effects of Water Quality: The Hidden Costs of the Green Revoluation to Infant and Child Health in India." Journal of Development Economics 107. (2014): 49-64. Menon, Nidhiya/Yana Rodgers. "Women's Land Rights and Children's Human Capital in Vietnam." World Development 54. (2014): 18-31. Menon, Nidhiya. "Technology Use and Firms with Female Principal Owners in Kenya." Journal of African Development 15. 2 (2013): 19-60. Menon, Nidhiya/Elizabeth Brainerd. "Religion and Health in Early Childhood: Evidence from the Indian Subcontinent." October 2013. Menon, Nidhiya/Rodgers, Yana. "Credit and Self-Employment." Handbook of Research on Gender and Economic Life. First ed. vol. 1 Ed. Deborah M. Figart and Tonia Warnecke. Northamption, MA, and London: Edward Elgar Publishing, 2013. 359-377. Menon, Nidhiya/Yana Rodgers. "A Meta-Analysis of Land Rights and Women's Economic Well-Being." November 2012. Menon, Nidhiya/Yana Rodgers. "Labor Regulations and Job Quality: Evidence from India." Industrial and Labor Relations Review 66. 4 (2013): 933-957. Menon, Nidhiya/Yana Rodgers. "Land Rights and Economic Security for Women in Vietnam." December 2013. Menon, Nidhiya/Yana Rodgers. "Impact of the Twin Economic Crises on the Philippine Labor Market." World Development 40. 11 (2012): 2318-2328. Menon, Nidhiya/ Yana Rodgers. "How Access to Credit Affects Self-Employment: Differences by Gender during India's Rural Banking Reform." Journal of Development Studies 47. 1 (2011): 48-69. Menon, Nidhiya. "Investment Credit and Child Labor." Applied Economics 42. 12 (2010): 1461-1479. Menon, Nidhiya. "Rainfall Uncertainty and Occupational Choice in Agricultural Households of Rural Nepal." Journal of Development Studies 45. 6 (2009): 864-888. Menon, Nidhiya/ Yana Rodgers. "Gender Inequality in the Labor Market During Economic Transition: Changes in India's Manufacturing Sector." Labor Markets in Transition and Developing Economies: Emerging Policy and Analytical Issues. Ed. Ravi Kanbur and Jan Svejnar. London and New York: Routledge Press, 2009. 341-363. Menon, Nidhiya/Glick, David. "Public Programs Pare Poverty: Evidence from Chile." Bulletin of Economic Research 61. 3 (2009): 249-282. Menon, Nidhiya/Rodgers, Yana. "International Trade and the Gender Wage Gap: New Evidence from India's Manufacturing Sector." World Development 37. 5 (2009): 965-981. Menon, Nidhiya. "The Relationship between Labor Unionization and the Number of Working Children in India." Indian Economic Journal 54. 3 (2008): 133-151. Menon, Nidhiya/rodgers, Yana. "Trade Policy Liberalization and Gender Equality in the Labor Market: New Evidence for India." Rutgers University World Affairs Review. vol. Issue 3, 2008. 1-25. Menon, Nidhiya / Sanyal, Paroma. "Labor Conflicts and Foreign Investments: An Analysis of FDI in India." Review of Development Economics 11. 4 (2007): 629-644. Menon, Nidhiya / Subramanian, Narayanan. "Learning, Diversification, and the Nature of Risk." Economic Theory 35. 1 (2007): 117-145. Menon, Nidhiya. "Inter-dependencies in Micro-Credit Groups: Evidence from Repayment Data." Journal of Developing Areas 40. 2 (2007): 111-132. Pitt, Mark/Menon, Nidhiya. "Program Evaluation Using Spatial Instruments: Evidence from Indonesia." 2007. Menon, Nidhiya. "Long Term Benefits of Membership in Microfinance Programs." Journal of International Development 18. (2006): 571-594. Menon, Nidhiya. "Non-Linearities in Returns to Participation in Grameen Bank Programs." Journal of Development Studies 42. 8 (2006): 1379-1400. 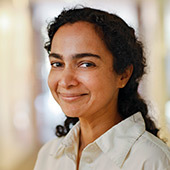 Menon, Nidhiya/ Sanyal, Paroma. "Labor Disputes and the Economics of Firm Geography: A Study of Domestic Investment in India." Economic Development and Cultural Change 53. 4 (2005): 825-854.